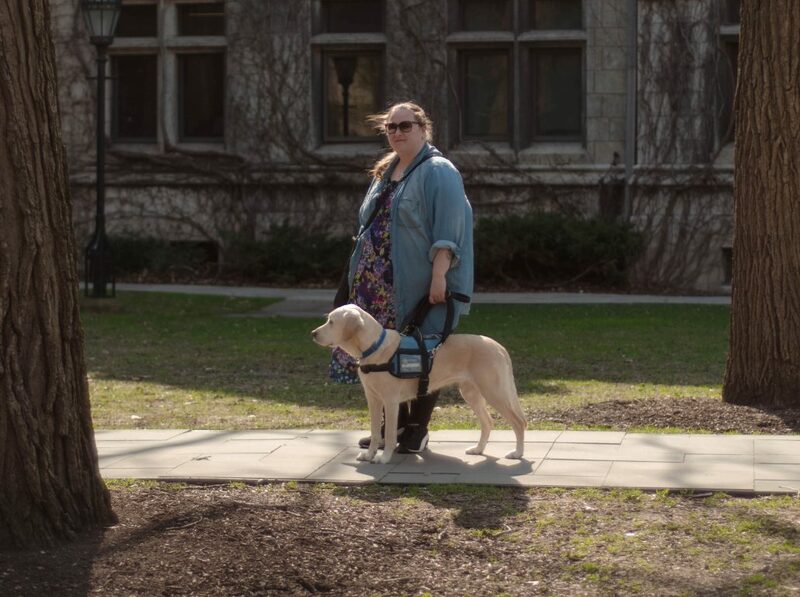 Along with her faithful service dog, Connie, Ailsa Lipscombe traveled from New Zealand to Chicago to pursue her life's greatest passion: the music that lets her body feel free. Ailsa Lipscombe has the words Per Aspera Ad Astra tattooed across her forearm. It’s Latin for “through hardship to the stars,” and Ailsa knows a lot about what that means. Now 25, Ailsa has been in pain for twelve years. At age thirteen, she fell over at a bus stop and twisted her ankle. It was a bad injury, but it should have healed quickly. But the pain spread. Her leg became swollen, purple, and freezing cold. It was ten months of agony before she was diagnosed with Complex Regional Pain Syndrome, a disorder that affects the nervous system. The symptoms vary wildly, from extreme skin hypersensitivity, muscles cramps and aches, and, in Ailsa’s case, slow loss of sight. The exact cause of CRPS is unknown, but even relatively minor trauma can trigger it, and the progression of symptoms is different for everyone. The next few years would be a major period of adjustment for Ailsa. At first, she was excited to have a name for what she was going through, but she soon learned that in this case, the name is not particularly helpful. “We are taught in society to expect a very linear model of health care, where you get sick, receive a diagnosis, receive treatment, and get better,” she says. “However, with CRPS there is no standard treatment plan and when I first developed it, very few doctors had even heard about it. After her diagnosis, Ailsa began to rely on crutches, and then a wheelchair to get around. School and socializing became difficult. In 2007, she fell into a coma and almost died. In 2009, she began losing her sight. Every day, Ailsa lives with extreme widespread pain from misfiring nerve signals, muscle and joint cramp, and allodynia–a hypersensitivity where stimulation that shouldn’t hurt causes severe pain. That means small tasks can be very hard. Something as simple as taking a shower often causes her to faint from overheating; cooking a meal can exhaust her to the point of being too tired to eat ; going for a five minute walk can leave her legs feeling like they are on fire, as if she just ran a marathon. She spends a lot of her day planning her energy very carefully. But none of this has seemed to slow her down. Ailsa, born in New Zealand, is currently living in the US after receiving a prestigious Fulbright Scholarship to study her PhD in music at the University of Chicago. Moving across the world would be a daunting prospect to anyone, but Ailsa’s health had made her question whether she’d ever be able to live independently. Connie, Ailsa’s Service Dog, would prove the vital support she needed to make the move in 2015. Connie, a four-and-half year old labrador-retriever, is trained primarily as a guide dog, but she helps Ailsa with many different tasks. “Connie gives me the independence to go out alone and be able to cross roads confidently and navigate busy and new spaces. She is trained in counter-balance–helping me up stairs by grounding me so I don’t fall–and in tasks such as picking up things for me that I drop. The only big thing that [my service dog] had to get used to was walking on the right side of the pavement, instead of the left! Ailsa’s PhD focuses on something she’s always loved: music. As well as researching it, she’s on the board for the Graduate Music Society, helps organize social events for the music department, and represents the Humanities Division on the Graduate Council. 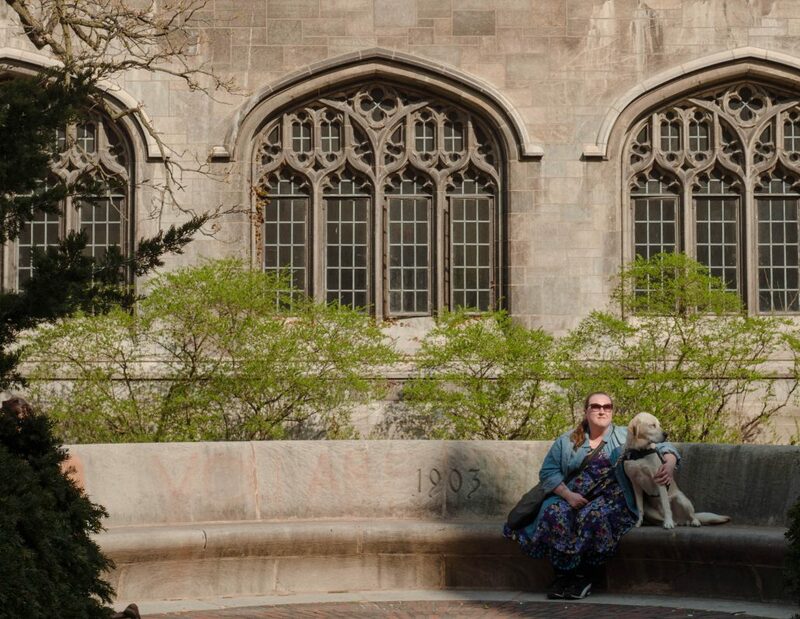 When she’s not busy at the University, she’s exploring Chicago, spending time at Lake Michigan – which reminds her of the beach at home in New Zealand – and singing, both solo and in a choir. Ailsa’s love of music began early. She recalls memories of singing in the car on road trips, and dancing in the living room with her sister. She learned to play the acoustic guitar and piano at elementary school, then the harp, Cuban percussion, and saxophone, as well as singing in choirs. She started private singing lessons at age eleven. 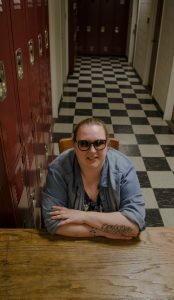 This passion spread into her academic life. After graduating college, she went on to complete a Master’s Degree at New Zealand’s prestigious School of Music. “A lot of my research focuses and has focused on bringing the voices of the unheard into the academy,” she says. Her recent work has looked at the under-represented voices of indigenous groups within animated films like Disney’s Frozen. When I sing, I feel free. I feel like music allows me to move beyond my body. She’s now exploring how patients experience sound in hospital. Her discoveries so far focus on the multifaceted meanings of sound. Pain and the perception of it is something Ailsa knows all too well. She plans her days carefully, thinking weeks ahead about what she wants to do and what is expected of her, to figure out what energy she will need and when. CRPS affects her entire body. But Ailsa says she is who she is today because of her health journey, not in spite of it. She plans on returning to New Zealand with Connie once she completes her PhD.